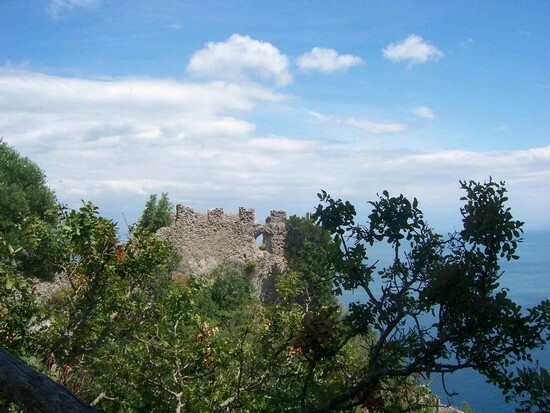 Enjoy beautiful views and a walk back through the legends of Amalfi in the Middle Ages on a hike to the 15th-century Torre dello Ziro watchtower. One of the dominant features of the mountainous landscape surrounding the seaside town of Amalfi is a watchtower set high above the cliffs on a promontory overlooking the sea. 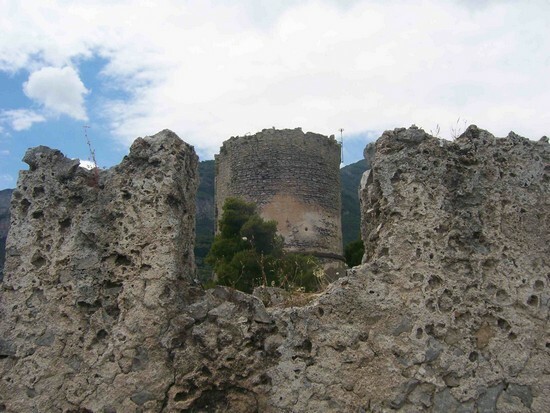 Called the Torre dello Ziro, this watchtower was once part of a large fortress built above Amalfi called the Castrum Scalelle, which served as the lookout point for sea attacks on the Republic of Amalfi in the Middle Ages. 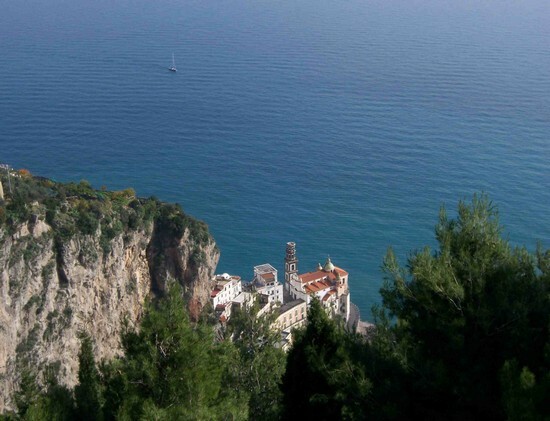 Surrounded by legends, a hike to the Torre dello Ziro is a fun way to experience the natural beauty and history of the Amalfi Coast while enjoying panoramic views of the coastline and Bay of Salerno. 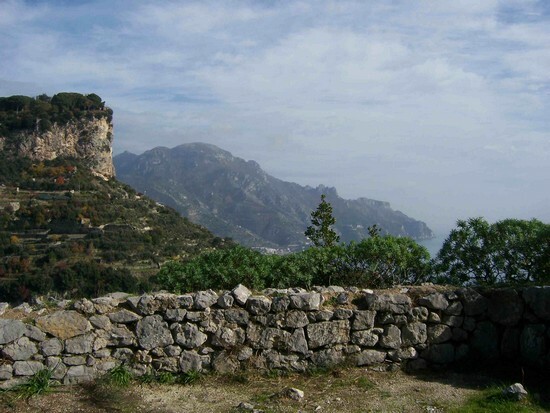 Although located above Amalfi, to reach the watchtower and explore the ruins of the medieval castle, the hike begins high in the mountains in the town of Scala. 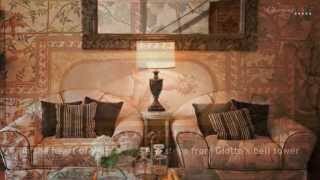 In the Middle Ages, Scala was a wealthy town and strategic part of the Republic of Amalfi. Today it is a sleepy village with many little hamlets and beautiful views. The hike begins in the hamlet of Pontone, which is the closest you can get to the tower by car. Follow signs to the Torre dello Ziro past the church of Santa Maria del Carmine, which is set right at the edge of the hamlet overlooking the valley leading down to Atrani. The rocky pathway and many stairs follow the valley above Atrani, and along the way there are plenty of spots to stop and enjoy the views of the town of Ravello across the valley. You’ll even spot the sheer drop from the beautiful Terrace of Infinity at the Villa Cimbrone gardens in Ravello. 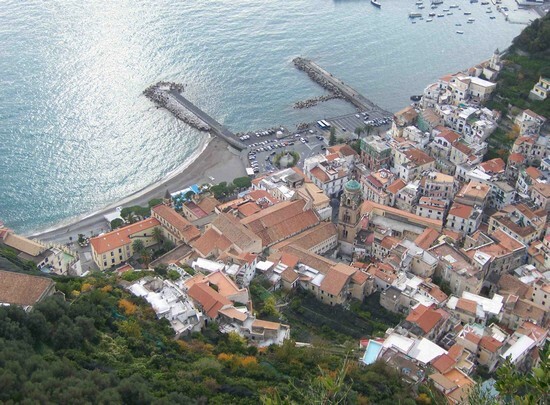 On the way to the Torre dello Ziro, look down and you’ll see Atrani and the beautiful Collegiata di Santa Maria Maddalena with its distinctive black and white 16th-century bell tower. The colorful buildings of Atrani are so vivid against the blue sea, and on a sunny day this is one of the most exquisite views you will find of this pretty town. Continuing the walk through dense pine forests, it is not long before you’ll spot the cylindrical Torre dello Ziro in the distance. This watchtower was constructed in 1480 by the Duke of Amalfi Antonio Piccolomini on the ruins of an earlier tower from the 12th century. While there is always something evocative about ruins, this particular watchtower very likely does have some mysteries hidden in its walls. According to popular tradition, it is said that this tower is where Giovanna d’Aragona, the Duchess of Amalfi, was murdered along with her two young sons. The story of her great love and scandalous marriage to her court butler and her eventual murder were recounted in popular tales in the 17th century, including The Duchess of Malfi by the English writer John Webster. Walking around the ruins of the castle, it’s easy to get carried away imagining what these walls have seen since their construction in the Middle Ages. 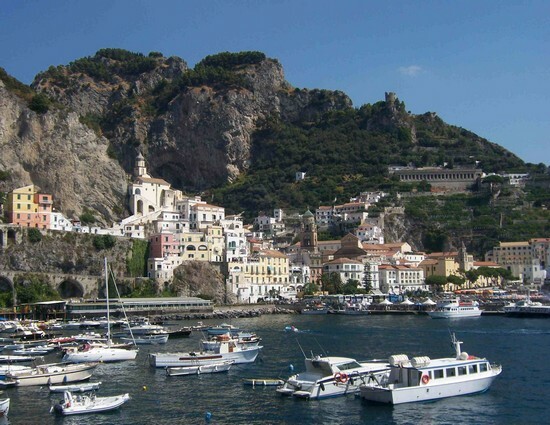 All of the glory and the eventual fall of the Republic of Amalfi, great sea battles, tragic storms, the arrival of the relics of Sant’Andrea and the countless coming and goings of the sailing ships that made the Republic so powerful in the Mediterranean. After exploring the Tore dello Ziro, you can continue higher up in the mountains to a small overlook that you can spot above the tower with its stone marker. The climb to get there requires many more stairs, but the views from the top are well worth the effort. 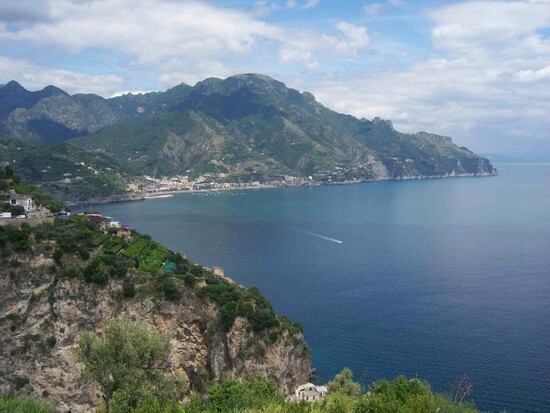 The views of the of the coastline looking toward Maiori and Salerno are simply stunning! 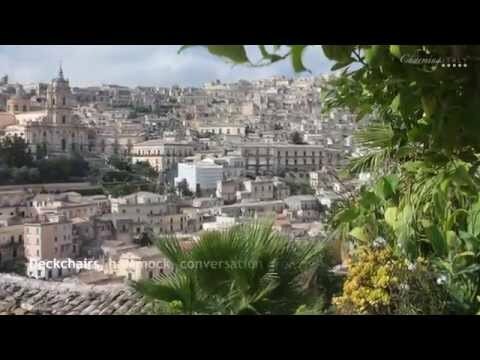 From the other side of the overlook you have an almost bird’s eye view overlooking the town of Amalfi far below. Look down and you can spot the bell tower and the façade of the Cathedral of St. Andrew and the medieval historic center of town. On a summer day the harbor of Amalfi is still busy with activity, but instead of the trading ships that once crossed the Mediterranean you’ll now spot the ferries to Positano, Sorrento and the island of Capri. 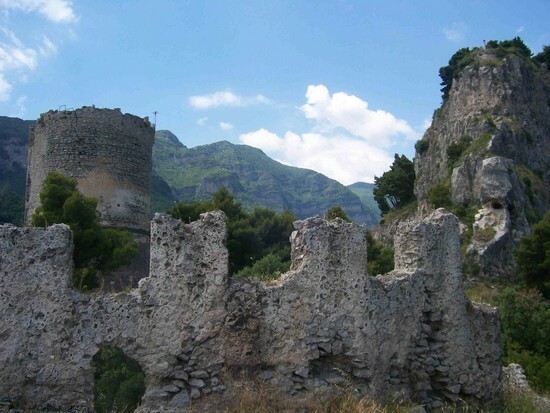 Once back in Amalfi, take a look back up to the mountains and you’ll see the Torre dello Ziro with entirely new eyes!